As voters head to the polls for the New Hampshire primary today, there’s another twist in the presidential campaign: Former New York Mayor Michael Bloomberg has confirmed for the first time that he is considering a White House run as an independent. “I’m listening to what candidates are saying and what the primary voters appear to be doing,” Bloomberg told the Financial Times. He added: “I find the level of discourse and discussion distressingly banal and an outrage and an insult to the voters.” He said the public deserves “a lot better” and noted that he is “looking at all the options.” Bloomberg, a billionaire who owns a media empire named after him, said he would need to start placing his name on state ballots by early March in order to have a serious chance to win. But victory would be very difficult. Six Republican candidates for president will take the debate stage on Saturday night, leaving only former Gov. Jim Gilmore frozen out of CBS’ prime-time event. Donald Trump, Ted Cruz, Marco Rubio, Jeb Bush, Ben Carson and John Kasich all made the cut, according to CBS’ criteria. It will be one of the smallest showdowns for the Republicans thus far this cycle, which at one point saw 11 people crowded on stage. To qualify for the debate, candidates had to either place in the top five of the New Hampshire primary, place in the top three of the Iowa caucuses, or place among the top five candidates in averages of national and South Carolina polls. Who can stop Trump? As expected, Donald Trump cruised to a crushing victory in New Hampshire on Tuesday night. (Who would have believed last June when Trump entered the race that we’d be yawning at his winning New Hampshire?) Trump blew away his competitors, securing well above 30 percent of the vote – more than double that of the first runner-up. And that’s where the real story of New Hampshire lies: Ohio Gov. John Kasich came from the bottom of the pack to secure a second-place finish. Will he be the savior to deliver us from Trump? Ben Carson is constantly reassessing his campaign. “I reassess the future of the campaign every day, so of course I will continue to do that,” Carson said on MSNBC’s “Morning Joe” after he was asked what would happen if he didn’t do well in South Carolina. 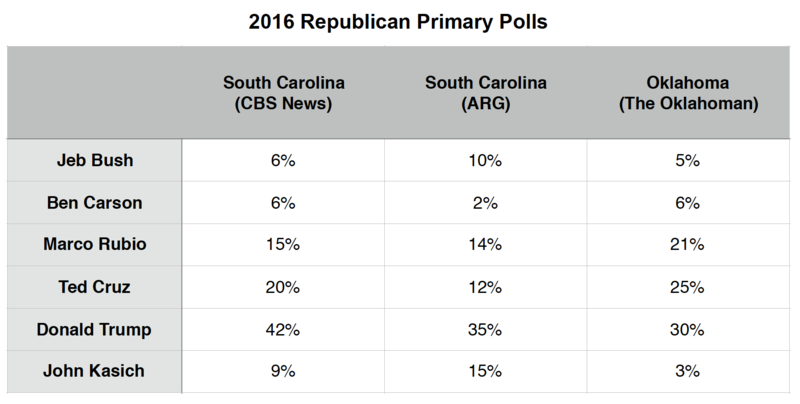 But Carson, who is currently in fifth place in the state, according to the RealClearPolitics polling average, has faith that South Carolina will change his luck. “I think South Carolina is gonna be the turning point,” the retired neurosurgeon said. He added that South Carolina is the type of place he loves to go to. Coming off of his first political win in New Hampshire, Donald Trump now has his sights set on South Carolina, and a new national poll shows he may be gaining even more momentum across the country. According to a poll from Morning Consult, he has more than double the support of any rival among self-identified Republicans and Republican-leaning independents. Trump holds a commanding 44 percent lead with this key voting bloc. His closest rival, Ted Cruz, only comes in with 17 percent of support. Ted Cruz and Glenn Beck unleashed a barrage of criticisms of Donald Trump on religion and social issues here, angling for support from voters in one of the most conservative parts of the state. At the massive Morningstar Fellowship Church, Cruz laced into Trump as weak on abortion, gay marriage and gun rights while Beck suggested Trump has never cracked open a Bible. “Too many people right now are looking at a guy like Donald Trump and believing that that man has ever opened a Bible. That’s the biggest crock of bullcrap I’ve ever heard. We all know it,” Beck said. Following a disappointing fifth place finish in New Hampshire, Marco Rubio is going on the offensive. Hoping for a better performance in Saturday’s South Carolina primary, Rubio has spent the last few days repeatedly blasting Donald Trump, Jeb Bush and Ted Cruz at various campaign stops in the Palmetto State. “Donald Trump has zero foreign policy experience,” Rubio said in Okatie, South Carolina. “Negotiating a hotel deal in another country is not foreign policy experience.” He also slammed Trump for recently using a vulgar word to refer to Cruz. $14.1 million to super PACs that can raise and spend unlimited amounts. Close behind: Tom Steyer, another billionaire who made his fortune running a hedge fund but now uses his money to push an environmental agenda that largely aids Democrats in federal and state elections. Steyer donated $13 million to his own super PAC, NextGen Climate Action Committee. There’s just something about South Carolina — maybe it’s the bad-karma ghost of John C. Calhoun (the ideological godfather of secession) — that just brings out the snarling mean in conservatives. More likely it’s the palpable fear among GOP candidates that Donald Trump is running away with the Republican nomination that accounted for the foul mood that descended on the sour debate stage in Greenville, South Carolina, on Saturday night.